A Conversation With Houston's 'Raptivist' Genesis Blu Genesis Blu is both a psychotherapist who works with teenagers and a rapper. "I love them equally," she says. Genesis Blu calls herself a "raptivist" — a mix of rapper and activist. Those who know the Houston hip-hop music scene know that it's long been dominated by men — like DJ Screw, Paul Wall and Trae Tha Truth. But as Texas Monthly wrote in October, "For perhaps the first time, there is a growing contingent of women taking over Texas's hip-hop scene." The "blue-haired matron" of Houston hip-hop is Genesis Blu. "Women have been here. They'll make you think that we just got here," she says. "I have big sisters in the game all around here and they've been here." NPR's Lulu Garcia-Navarro met her at SugarHill Recording Studios, where Genesis Blu recorded the tracks for her EP, Bluming Season. Genesis Blu calls herself a "raptivist," mixing hip-hop with advocacy. She says she dedicates time to "facilitating change in her community." The dual passions for politics and music started at a young age. "I would be like 12 years old, going to a nightclub, where people are smoking and drinking. I was always a different type of kid, so my songs would be about the struggle, the political climate — even that young. And they would be like, 'Where is this little girl coming from with this stuff?' "
But when she got older, she put the music career on hold and focused on school — a lot of school. She got a bachelor's, a master's and started her doctorate. Until she had an epiphany one day — she wanted to be back in the community, writing music. She was in the middle of her dissertation. "I literally stopped that day, put down that pen and picked up another pen and a notepad and began to write music," she says. "And I've been doing that since." Well, it's not quite all of what she's been doing since. She's also a full time psychotherapist. 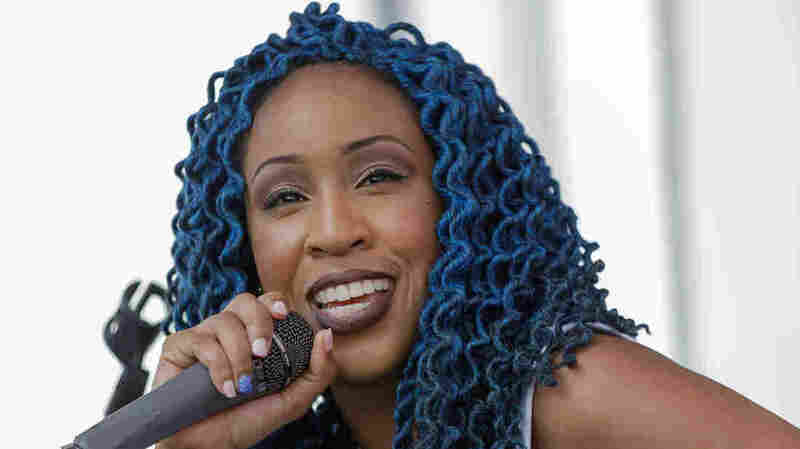 Blu works with children and families and teens "who are removed from their home due to abuse of some sort or due to their emotional disturbances," she says. "People ask me to choose [between music and therapy] and I cannot, I love them equally," she says. "Because you're able to change lives both ways." Genesis Blu talked more with NPR's Lulu Garcia-Navarro about growing up in the Houston neighborhood of Greenspoint and her grandmother's influence on her life. The diversity is beautiful. But yes, I don't want my people left behind. So, what's happening here right now is gentrification, in the worst way. They are pushing these people out. And there's not many other options [of places] to go, because we don't have a great public transportation system, in case you haven't noticed. It's upsetting a lot of us who have been in this community and are working in this community. And so even though I'm very happy about the diversity, what it also is doing is allowing people to come in with a bunch of money, throw money at some things, tear some things down, buy it out — and then leave the people who have been here stranded. On her grandmother's influence and calling herself a "raptivist"
My history is that my grandmother grew up in another neighborhood in Houston as well called Acres Home[s]. So living between Greenspoint and Acres Home[s], which were rivals at the time when I was a kid by the way. So I would have to go to my grandmother's house after school if my mother couldn't be home from work. And that was interesting because I was bullied — a lot. Because I'm too proper for the black kids and I'm not white enough for the white children, so I'm in a very awkward place. But still loving the culture of where I come from. But my grandmother was also an activist. She was very influential in the war on drugs here in Houston. So as a little kid — I don't even know, I was little, I don't even know how I remember it — she would have me marching with her. So I get that from her. And she passed away. But I always said that I would continue that legacy for sure, because she inspired me.